Today’s demand for more reliable and cost-effective well design solutions as the complexity of wells increases suggests the need to innovate and modernize traditional techniques, including those affecting well integrity. CasingWear is an innovative well engineering software application that provides a comprehensive approach to well integrity evaluation using advanced engineering models and accurate data processing. CasingWear Well Integrity Software is integrated within the comprehensive Engineer’s Desktop™ (EDT™) suite, sharing data among all of Landmark’s drilling and completions applications to help reduce costs and optimize production across the entire well construction lifecycle. A novel method for validating the estimated groove positions using the full 360° spectrum of caliper or ultrasonic logs has been presented. Accurate wear prediction is important for well integrity and optimized well designs. 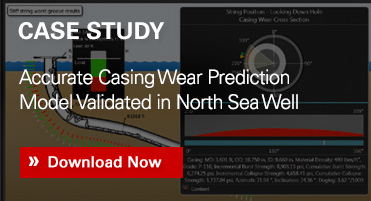 The proposed method has been validated using measured wear log data from an offshore well in the North Sea. CasingWear helps reduce uncertainties caused by inconsistent application of the casing wear model. 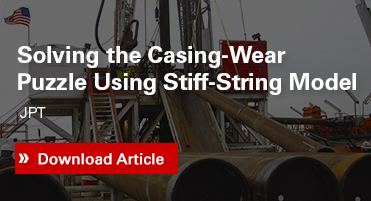 Accurate wear prediction is crucial for well integrity to reduce field development costs associated with casing, especially when drilling and completing complex sidetracks, multi-laterals or long horizontal wells. The user interface provides a simple approach to input data and powerful graphical visualization capabilities to help you interpret it faster and more accurately. The Output-Driven-Input™ methodology identifies required data and provides hyperlinks to the appropriate input panel. The interactive wellbore schematic provides visual feedback throughout. Users can conduct fast and accurate analysis for better decision-making.